This is the hardest question to answer because so much depends on whether the other party or their attorney wants to fight or find a solution. In a court case you are subject to the judge’s calendar and priorities and the other side’s attitude. If both parties can work out an agreement, the case can be done in a matter of weeks. If one party wants to fight and manipulate it takes time to out-maneuver them. So the short answer is from a few weeks to more than a year. Yes. I get this question a lot from unmarried parents. Can’t we just make an agreement and sign it? You can, but you can’t enforce it. In other words, it’s not worth the paper it’s written on. To be an agreement you can make stick, it has to be an agreement made part of a court order or judgment which is signed by the judge. In the case of married parties, the only way you can get “unmarried” is by filing a case in court and getting a judgment—by agreement or by trial. Can we just use a mediator? 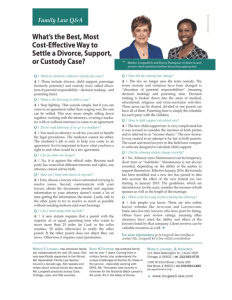 Mediators cannot perform the legal procedures for a divorce, nor can they give either party advice. Their function is simply to get an agreement and they cannot comment on the fairness of the agreement if the parties agree. The better method is to get a lawyer who is settlement oriented and then go to the mediator and confer with the lawyer so that you understand your rights. 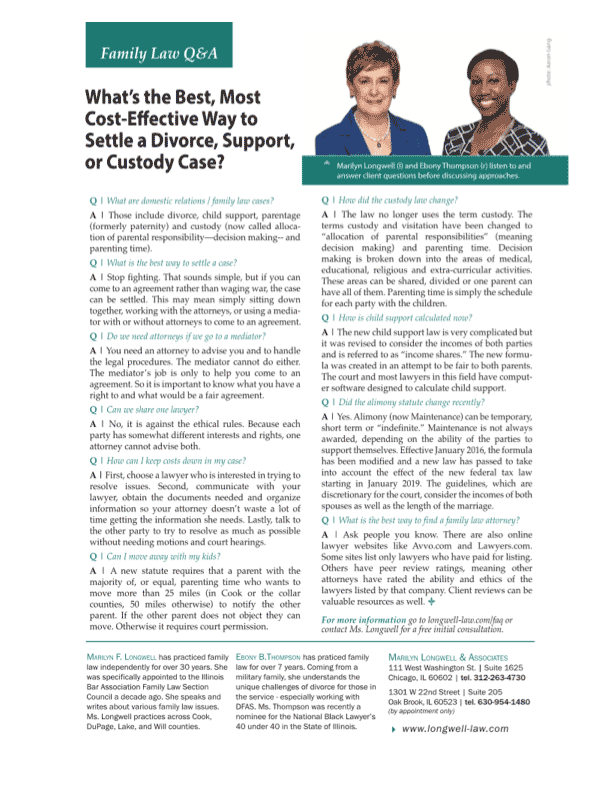 Illinois no longer uses the term “custody.” The legal responsibilities that were meant by the term custody are now divided into parenting time (schedule) and decision-making responsibilities in the areas of Healthcare, Religion, Education and Extra-curricular activities. The parties may jointly share decision-making, divide it between them, or one parent may be awarded all of the decision-making. Generally the factors to be considered are the same as in custody cases of the past. Alimony is now called maintenance. A new statute regarding the award of maintenance contains guidelines based upon the length of the marriage and the parties’ incomes. The judge is not required to follow the guidelines, but most of them do unless given a strong reason to do otherwise. Will the new tax law effect my maintenance? Through the end of 2018, maintenance will be taxable to the person receiving it and deductible to the party paying. As long as the judgment is entered before the end of 2018, that tax treatment can apply in the future despite the new tax code. Beginning in 2019 maintenance will not be taxable to the recipient or deductible by the person paying, so new guidelines are being passed to make maintenance paid based on net income instead of gross income to produce a fairer outcome for both parties. How much child support will I collect? Child support used to be calculated as a percent of net income. Now there is a formula based on both parties’ incomes. It is difficult to calculate unless you use computer software made for that purpose. Can dads get child support? Yes. Child support is not gender specific. It depends on the parties’ relative incomes and, to some extent, the amount of time each parent has the children during a year’s time. Can husbands get alimony (maintenance)? Yes, in fact the hardest part of my job has been, on occasion, to tell a woman she’s going to have to pay maintenance to her soon-to-be-ex husband. They hate it as much as husbands do, but they expect it less, no matter what the income difference is. Is maintenance not going to be deductible anymore? Under the new federal tax code, for persons divorcing after January 1, 2019, those who pay maintenance cannot deduct it and those receiving maintenance do not have to pay tax on it. This does not apply to divorces prior to 2019 or to changes to the amount of maintenance which started before 2019. In Illinois the law has been amended so that the calculation on maintenance starting after the end of 2018 is changed in an attempt to make the net effect on both parties about the same as before the change in the tax law. I have done estimates on a couple of my clients and found the effect to be very close. I’m not happy with my lawyer, can I change? Usually yes, unless it’s too close to a trial date that is set. You should think about why you are unhappy. There are lots of reasons. If you are not satisfied for any reason you should at least interview one or two attorneys to get their take on your case. If that doesn’t satisfy you about your lawyer you should change. Staying with an attorney you don’t feel happy with will not improve your case, no matter how justified or not your feelings are. To have an outcome you can be satisfied with requires good chemistry with your lawyer. If you don’t have it you need to change for both of your sakes. My child’s mother took our daughter and moved out. We were never married. What can I do? Unmarried parents have the same legal rights and duties with regard to their children that married couples have. If you have both signed a Voluntary Admission of Parentage (VAP) you are legally the father and don’t have to prove it with a DNA test. If not, such a test will be necessary to establish you are the legal parent of the child. You will need to file a petition in court and when parentage is established by VAP or by DNA, parenting time, child support, and Parental Responsibilities (in other words the right to make major decisions) will have to be decided. If you can agree on these issues then an Allocation Judgment will be entered which will govern how you co-parent your children.